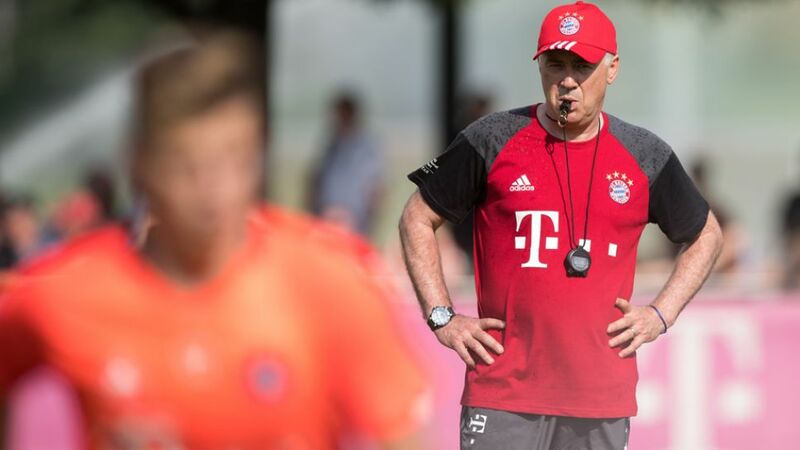 Carlo Ancelotti took charge of his first training session as FC Bayern coach in sweltering heat in Munich. Carlo Ancelotti took charge of training for the first time in his new role as FC Bayern München head coach on Monday afternoon. In sweltering heat in Bavaria, Ancelotti gave a 19-strong squad a first taste of what his regime will be like. After a barely-required warm-up given the soaring temperatures, the players undertook a number of passing exercises and game-play situations in the 65-minute-long session. Douglas Costa, who is nursing a thigh injury that will sideline him for Brazil's Olympic Games bid on home soil, worked individually in the gym while Copa America Centenario winner, Arturo Vidal, and Bayern's representatives that played at UEFA EURO 2016, such as Jerome Boateng and Joshua Kimmich, both named in UEFA's Team of the Tournament, were absent.